Storyboards can be used to develop children's attention and listening skills, story sequencing, vocabulary, oral language skills, independent writing and social interaction skills. Storyboarding is a way of group storytelling using visual prompts. As the story is told symbols or objects are used to help the group understand and remember the words. a board on which to place these items as the story unfolds. 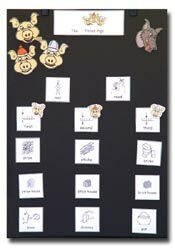 The story may be told by the teacher to a group, but equally well, children can join in adding items to the board or even telling parts of the story themselves.